Hey guys, turning to here to try and see if someone can help me figure out this S4. I replaced the intake manifold due to the flap actuator being completely seized, along the way, i also replaced the valley pan gasket with the oil filter housing gasket since it was leaking. After re-assembly, the car still has the same misfire codes, cyl 1-3 and 7. The ignition coils and spark plugs were replaced, i checked the park plugs and they seemed a bit burned, but nothing to be concerned with. I also swapped the coils and plugs from bank to bank 1-4 2-5 3-6 4-8. Still the same cylinders are still misfiring, and I am still hearing backfire coming from the intake (with the MAF unplugged the backfire stops, but MAF readings read fine when plugged in). The misfire is only at idle. anything above 1k-1.2k+ and no misfire. there is still a strong smell of fuel coming from bank 1, while bank 2 didnt smell that bad. 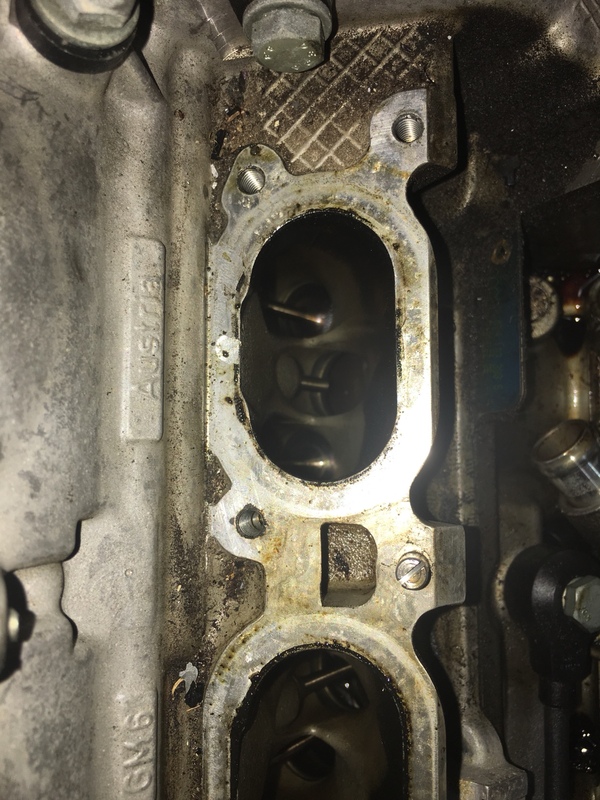 (issue that carried over with the intake manifold swap, which came with injectors of its own). Tomorrow im going to take off the intake manifold and swap the gaskets, along with possibly the spark plugs. But something is telling me this isnt a spark plugs issue. Can you read codes from the OBD II port? That would help. Misfires at idle make me wonder about the mechanical cam adjuster failing. At first i used vag com and it gave me fuel trim fault codes, and misfires. Misfire cylinder 3- limit reached. And the same for the other cylinders. After i clear the codes, only misfire that comes back as a hard fault is cyl 3. But if i drive the car, the other cylinders show up as well. No timing codes what so ever. When i had vagcom, adv. Mes. Val. 93 gave me 2 readings, one was at a very high 43%? And the 2nd measure was low, around 11% if i remember correctly. I bought an s4 that was backfiring through the intake and running really rough, earlier symptoms as described by previous owner was lose of power. Then I discovered the engine actually jumped time. Scan the car with VCDS should give you some clues. My advise would be if it’s timing related not electrical then don’t drive it and get it fixed, the one I have this happened to it and explains the backfiring. Did you buy the car with timing codes? Yes I bought it with the fault codes, I kinda knew what I got myself in to. I thought so too! Since the intake manifold flap was seized, figured thats what was causing the misfires at idle. Could a clogged cat cause this? maybe for 1-2-3 but don't know about 7... different bank. Check the harness too? Piggy Pipes, Milltek non-res cat-back exhaust, JHM 93 Tune, JHM Short Throw Shifter, Updated RS4 upper and lower timing guides, Brembo 18Z w/RS4 SS lines, Hotchkiss RS4 Front Anti-sway bars, BC racing BR coilovers, EB-Works adjustable rear end links, 034 Motorsports spherical end links. 034 Motorsport Engine mounts, 034 Motorsports Silicon MAF hose, Hartmann 19" RS4 Reps +5mm 42DD front +10mm ECS rear. Also the fuel smell coming from bank 1 is curious. Sorry to say this,its timing guide time for you . Had same thing on my car , whole passenger bank misfiring with cyl 3 being the worst. So called pro mechanics had it diagnosed as wiring harness , then injectors etc. Ended up being center guide broken.